WooCommerce Product Table comes with several language translations already included. It’s also officially certified as being fully compatible with WPML, the world’s leading WordPress multilingual plugin. This makes it easy to use product tables on multilanguage sites and add your own translations. 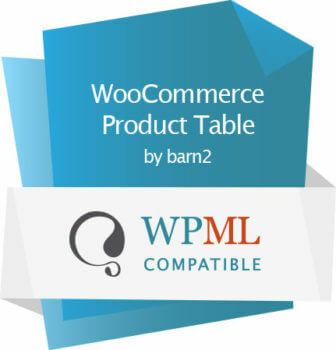 Please see our setup guide on using WooCommerce Product Table with WPML. Many of our customers have kindly contributed translations to the plugin. At the present time, WooCommerce Product Table comes with complete translations for: English, French, Spanish, German, Italian, Dutch, Finnish, Hebrew, Polish, and partial translations for Swedish, Norwegian, Portuguese, and Greek. To use the plugin in one of these languages, simply set your site’s language under the Settings > General menu in the WordPress admin. If your language is not listed above, you may wish to translate the plugin yourself. To do this you will need to follow the steps below. The .pot file for the plugin is provided in the plugin’s /languages folder. You use this file to translate the plugin into your chosen language. We would recommend PoEdit for making your translation, but you can of course use an alternate method. Once you have made your translation, save the file as woocommerce-product-table-<locale>.po, replacing <locale> as appropriate. For example, the locale for Italian is it_IT, so the file name would be: woocommerce-product-table-it_IT.po. Your .mo file should have the same format, e.g. woocommerce-product-table-it_IT.mo. WooCommerce Product Table has an option that you can use to change the column headings, so you don’t have to use the default translation provided. Please see the instructions on how to choose your own column headings. If you create a translation for a language we don’t currently support, we would love to add it to the plugin! Please contact us and attach your files so we can add them to a future release. Does the plugin support RTL/right-to-left languages? Yes, if you select a RTL language such as Hebrew under Settings > General then the text direction should go from right to left automatically throughout your website, including in the product table.